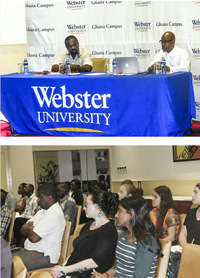 HomeWebster Life News2016 > Lecture Series: Ethics in Campaigning in Ghana, U.S.
Lecture Series Examines Ethics in Political Campaigning in Ghana, U.S.
Webster Ghana hosted a talk by faculty members Jean-Germain Gros and Vladimir Antwi-Danso. 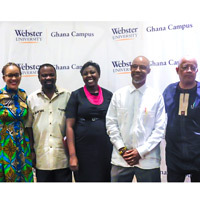 The Webster University campus in Accra, Ghana, held a public lecture on political campaigning in the United States and Ghana as both countries prepare for national elections in November 2016. Webster international relations faculty members Vladimir Antwi- Danso and Jean-Germain Gros presented “Ethical Political Campaigning: the case of Ghana and the U.S.,” part of a longer Webster Ghana lecture series that will span into the 2016-2017 academic year. Antwi-Danso and Gros shed light on the upcoming elections. As campaigning is already in full flight, the lecture was especially important in emphasizing the necessity behind promoting an ethical electoral process to ensure fairness, freedom and transparency. Their expertise proved invaluable in tackling questions such as: How and why do people vote the way that they do? What role do the politicians and their campaigns play? Are campaigns always ethical? with examples from U.S. and Ghana. Antwi-Danso spoke boldly on the case of Ghana, highlighting unethical practices such as dishonesty, inconsistency, and the role of money. Gros then spoke about the United States of America, with emphasis on the controversial Donald Trump. He pointed to a lack of choice for voters, and the use of private capital in the campaign process as unethical practices in the electoral process. They both presented to an attentive, intrigued, and diverse crowd of attendees who were attracted to the event by social media, a radio promotion conducted by campus director Christa Sanders and Gros, as well as the prominent and internationally recognized Webster name. Attendees included individuals from the private and public sector as well as current, prospective and international students of Webster Ghana. Webster Ghana organizers hope the event paves the way for more successful lectures aimed at educating and engaging the local community with the insights, perspectives and expertise available through Webster's network.